Five studio albums over twenty years of grooves. 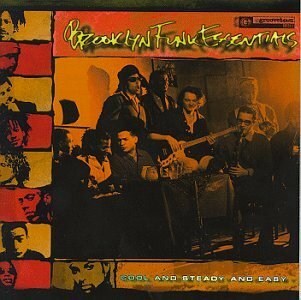 Brooklyn Funk Essentials 2015 album, ‘Funk Ain’t Ova’, sees the band going back to it’s roots in more ways than one. Brimming with classic seventies’ vocal group soul and instrumental funk, the album was recorded all live in studios in Brooklyn, Birmingham and Stockholm. This record brings together many of the original and past members of the band, such as Joi Cardwell, Papa Dee, Stephanie McKay, Everton Sylvester and Hanifah Walidah on lead vocals. The horn playing of Anna Brooks (saxes) and Iwan VanHetten (trumpet), who also handles all keyboards, with added cameos by Josh Roseman, (trombone) Bob Brockmann (trrumpet) and Paul Shapiro (sax and flute). The drumming of Yancy Drew and Hux Nettermalm coupled with Danny Sadownick’s percussions. The guitars of Masa Shimizu and Desmond Foster, who also does lead vocals on ‘Brooklyn Love’, ‘Blast It!’ and BFE’s rendition of Roy Davis Jr and Peven Everett’s classic club hit, ‘Gabriel’. Bill Ware’s vibraphone playing, which has not been heard with BFE since ‘Cool & Steady & Easy’ is featured on the song ‘Unique’, co-written by Carlton McCarthy. As always, founding member Lati Kronlund plays bass and is also responsible for the album’s production. ‘I’m Gonna Find Me A Woman’, is a re-working of a hitherto unreleased song which BFE recorded in the nineties with the late, great Isaac Hayes. ‘Prepare’ was co-written by legendary house diva, Crystal Waters, who can also be heard on background vocals. Even with their choice of record label, BFE are back where they started out with Dorado Records, who were the first label to sign the band, back in 1994. The album is available on vinyl, CD, streaming and digital download. Watcha Playin’ was BFE’s come-back album of 2008. It is the result of fans insisting that the band tour again, and band members writing and playing new songs during these tours. In that respect, it is probably BFE’s most coherent album. It is not an album about a city. At this time, the band were no longer all living in New York. Instead, members were spread out in different countries in the world, and what kept them together was the love of the music and playing it together. This is clear on crafted songs like Dance-Free Night (about New York’s restrictive dance laws in clubs), For A Few Dollars More (about the greed of people with money) and The Park (about falling in love in Prospect Park). Recordings for 'Make Them Like It' started already in 1996. It was actually supposed to have been BFE’s second album, but the Turkish adventure of 'In The BuzzBag' got in the way. Both the title track and 'Mambo Con Dancehall', as well as 'Kik It!' were songs based around sax player Paul Shapiro's timeless and inimitable hornlines. 'Date With Baby', 'Martha' and the by now very famous fan favorite, 'I Got Cash' was Lati and Everton experimenting with merging funky disco with dub poetry - Barry White meets LKJ... 'Woman Thing' turned Erroll Dunkley's 'Little Way Different' into a feminist anthem duet featuring Stephanie McKay and Hanifah Walidah. Papa Dee moves away from the chatting when he sings Gregory Isaacs' classic 'Confirm Reservation' over an eerie funk-house groove locked down by drummers Yancy Drew and E.J. Rodriguez. 'Jump Around Sound' is a twangy punk-ska thing featuring Josh Rosman's trombone melodies which has become an audience jump up favorite. None of the periodic publications namedropped in 'I Got Cash' reviewed the album on it's release. Buzbag was the name of a cheap Turkish red wine. Not very good, but there was lots of it floating around in the Istanbul recording studio during the nine days and nights it took to record this album. In The BuzzBag is about the meeting between New York and Istanbul. Two cultural centres dotted with towers and held together by bridges, shrowded in smoke and crowded with speeding yellow taxi cabs. Brooklyn Funk Essentials headlined the 1996 Fuji World Music Festival in Istanbul, and as a third encore, they played a funky dancehall version of the classic Turkish melody, 'Üsküdar'. People went nuts. After the show, the promoters asked the band to come back to Istanbul and record that song together with the 11-piece Turko-Roman band Laço Tayfa. One member of this group was a young clarinet virtuoso by the name of Hüsnü Senlendirici. Today, he is a mega star in Turkey and he still performs regularly with BFE, both live and in the studio. There were no click tracks, computers or samplers on In The BuzzBag. The songs were literally written as the band played them. And even though Imaj Studios were the biggest facility in Turkey, with the two bands numbering 23 people together, every single room was used to mic up something or somebody. The four BFE singers were eventually housed in the studio elevator, which had to be switched off for the purpose. The album earned BFE their first Grammy nomination. Cool & Steady & Easy is all about New York. It is a musical trip on the L-train from Brooklyn to 8th Avenue and back again. The album chronicles the creation of the band that became Brooklyn Funk Essentials. Some of the songs started off as sampling and splicing sessions in Arthur Baker's Shakedown Studio. Others were outright late night jam sessions with the budding band. It was first released in 1994 on Dorado Records in the UK and most of Europe, and then picked up by RCA-Groovetown in the US, where the album was released in 1995. Already between these two releases of the “same” album, there is an audible difference, where what started off as a studio project was becoming more and more of a live band. This is perhaps most notable on songs like Madame Zzaj, from the Dorado release, which on the US release has been re-written, re-recorded and re-named Mizz Bed-Stuy. Instead of samples and DJ cuts, the new track featured vocals by Everton Sylvester and drummer Yancy Drew. Bop Hop had the same treatment, and Brooklyn Recycles was remixed and tightened up on the Groovetown release.